He served two terms as circuit court clerk, but was forced to retire to private life on account of what his physician diagnosed as tuberculosis. He built a home on Cedar Hill and moved there the same year. By adopting a series of deep breathing exercises, he cured himself in two years. It was in 1845 he built his home, which still stands on the hill, and in the fall of 1845 he married Mahuldy Schultz. He was the father of four children: Alexander Moore, Mary, Carrick, Carriger, and Frank. .... When the Civil War came on B. F. Cloud was too old to enlist in either army. However, his sympathies were with the South, because he was a slaveholder. Notwithstanding the fact that my father was a Southerner at heart, he would help either a Federal or Confederate soldier to escape if in his power to do so. In 1865 he was called upon to represent Claiborne county in the legislature, and was later elected to the state senate. He died at his home in Tazewell in 1886. [S1548] Seen and Heard, J.A. Dunn. [S4251] 1850 US federal census, 1850 census, TN, Claiborne, 7th sub. Eastern Dist, (M432-874, p.270). 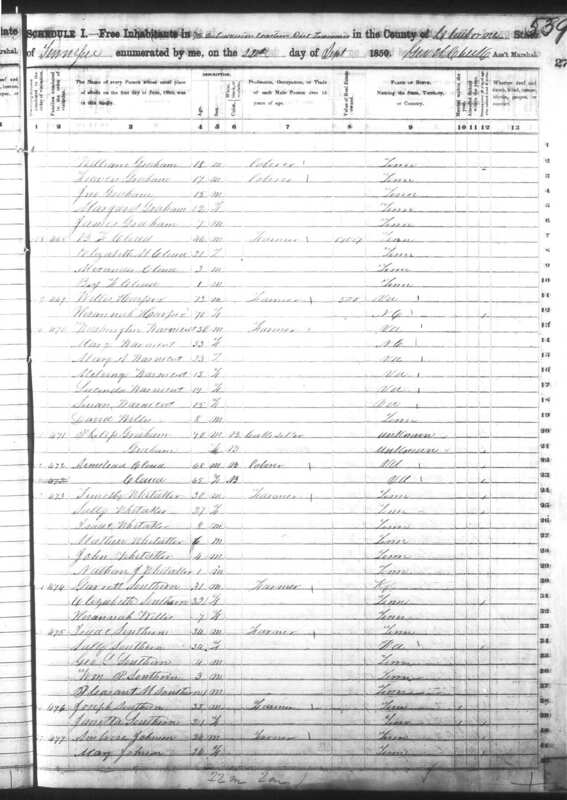 [S136] 1860 US federal census, 1860 census, TN, Claiborne, Tazewell, p. 186, (M653-1244, p.340).